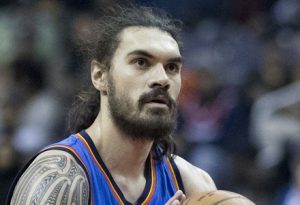 The Civilian – Opinion: Will Steven Adams at least play table tennis for New Zealand? Opinion: Will Steven Adams at least play table tennis for New Zealand? By sports columnist Jock Harrison. If Steven Adams has any decency left – and you’d have to say, it looks like he doesn’t – then he’ll at least consider playing table tennis for New Zealand. Or something relatively easy, like lawn balls, for goodness sake. How hard can it be? Front up mate. Do the right thing. Play for the country that pushed you, headfirst, through its big, testosterone-coated birth canal into the light of Rotorua. The country that gave you everything. The country that gave you a birth certificate. The country that gave you a passport. The country that gave you passing media coverage at 6:47pm one night a week. Honest to Lomu, I’ve had it up to here with these self-loathing, unpatriotic kiwis making excuses for Steven Adams over his neglectful, selfish attitude towards our game, New Zealand’s game: basketball. Look mate, you were born in New Zealand. Isn’t that enough? What more do you want from us? Is it money? Is it moral support? Is it actual local interest in the game that you love as opposed to a blind desire to win at everything even if we don’t really even know what it is? You don’t see your sister throwing puts for the Oklahoma shotput team. You never will. It doesn’t exist, and every dead-to-rights New Zealand sports fanatic knows the Oklahama City Lightning wouldn’t exist without you, either, mate. And neither can we. You’re holding us back. We don’t have time to wait until Richie McCaw’s baby grows up. We need you now, and you’re holding us to ransom. I get it. You’re bitter because you and a bunch of poor kids couldn’t afford to play in the junior national league. But you clearly never wanted it anyway, because now you can afford it, and you still refuse to pay to do it. You don’t want to play basketball for New Zealand? Fine. Win us something else then. Win us table tennis. Have you seen those guys? They’re tiny. You could win us the world cup in a day. Is there a world cup? I don’t know. It doesn’t matter. We want it. Sailing. You could help us with that. Big arms. Boats. Sailing. Gymnastics. Probably not. But honestly, you’re not going to play basketball, so tough. My son’s rugby team. It’s the least you could do. They’re like six years old. Come on, mate. Ambulance on standby. My shout.